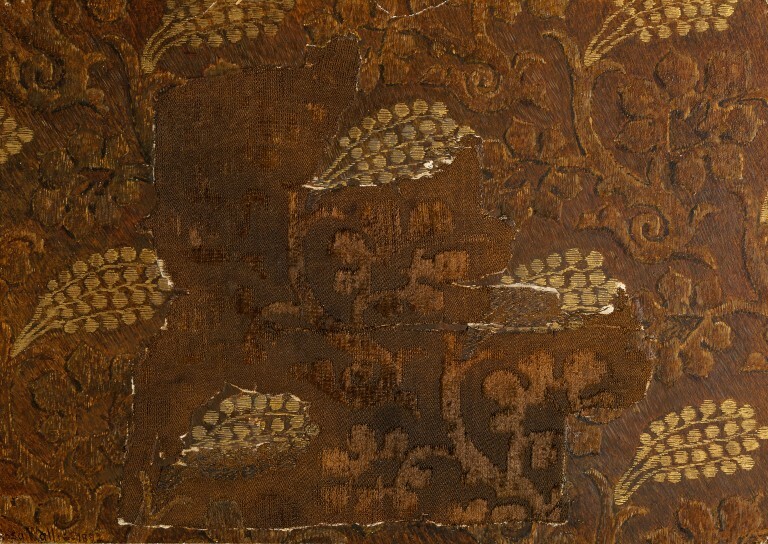 This small brown textile fragment has a design of sprigs of trailing, wisteria-like flowers executed in cut silk pile, voided on a satin ground and brocaded with a filé thread of gilded metal wound around a yellow silk core. It is reputed to have come from the tomb of the Holy Roman Emperor Charles IV, who died in 1378. The tomb in St Denis, north of Paris, was opened in 1824 and three other fragments of the same velvet are in Nuremburg. Textile fragment with floral design of cut silk pile voided on a satin ground, brocaded with gold. Design of sprigs of trailing, wisteria-like flowers executed in cut silk pile, voided on a six-shaft satin ground, and brocaded with a filé thread of gilded metal wound around a yellow silk core. Fragment stuck to card with watercolour of design. Reputed to have come from the tomb of Emperor Charles IV, who died in 1378. Lisa Monnas says in her article in CIETA (see reference) that the dating is problematic due to the velvet having technical and stylistic affinities with early 15th, rather than late 14th century silks. The ground weave is virutally unique among Italian silks of this period, as it is woven with a six-shaft rather than the more usual five-shaft satin ground. Furthermore, the design is more reminiscent of textiles depicted by Italian painters of the first half of the 15th century. The fragment is stuck to a piece of card with watercolour; the design of this tissue has been completed in water-colours by miss Rosa Wallis. 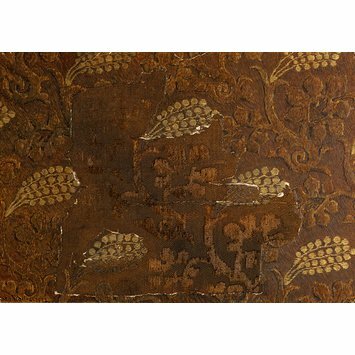 Velvet with floral design of cut silk pile voided on satin ground, brocaded with gold. Monnas, Lisa, 'Developments in figured velvet weaving in Italy during the 14th century' in Bulletin de Liaison du Centre International D'étude des Textiles Anciens (Lyon: CIETA, no 63-64, 1986), pp.63-100. Bock, Franz, Geschichte der Liturgische Gewänder im Mittelalter (Bonn: Henry & Cohen, 1859-1871), vol. 1, pp. 110-112, pl. XVIII. Hampe, Theodor, Katalog der Gewebesammlung des germanischen Nationalmuseums (Nurnberg: Germanisches Museum, 1896-1901), 2 vols., Cat. no's. 592, 593 & 594, p. 104. Millauer, Maximilian, Die Grabstätten und Grabmäler der Landesfursten Böhmens, Königlich Böhmische Gesellschaft der Wissenschaft, (Prague 1830), Neuefolge Band II, pp. 53-57, 75-77. Lisa Monnas (see reference) points to a date of early 15th century.